Beginning today, the first anniversary of Kim Jong Un’s assumption of power in North Korea, 38 North is publishing a three-part analytical series written by Dr. Alexandre Y. Mansourov assessing the leadership changes during Kim’s initial year in office. The first article, published today, addresses three fundamental questions: who really governs the country, how stable is the current North Korean regime, and what lies over the horizon for the leadership transition? Part two will analyze key dynamics within the Kim family, including the rising influence of Kim Jong Un’s uncle Jang Song Thaek and the emergence of Kim’s wife, Ri Sol Ju as a factor in family politics, as well as the regime’s efforts to preserve and modernize the Kim monarchy. The article will also discuss how the regime seeks to strengthen the socialist party-state, reinvigorate the party’s central leadership institutions, tighten the party’s control over mass public organizations, and watchfully manage the party’s center-periphery relations. Part three will analyze the main drivers and direction behind Kim Jong Un’s transformation of the government he inherited from his father, focusing on his overhaul of the national security establishment and party-military relations, restructuring of the socio-economic team, and adjustment of the foreign policy team. A year into Kim Jong Un’s rule, the formal father-to-son succession is over. But the political transition from the Kim Jong Il-centered totalitarian one-man rule to a more complex authoritarian governing system—so far centered on the new leader—still continues. North Korean leadership politics has become as vibrant, hard to predict, and somewhat open-ended as it was during past political transitions in North Korea, especially in the late 1940s, early 1970s, and mid-1990s, leading some Western pundits to question the stability of the current regime. Although the domestic political situation in Pyongyang is no longer static, I judge it to be dynamically stable and conducive to further development towards a more responsive, accountable, and efficient government. Kim Jong Un and the forces standing behind him shattered the political status-quo inherited from his father last December with bold and speedy actions aimed at discarding the legacy governing system, rejuvenating and revamping the country’s national security establishment, restructuring its economic policy-making apparatus, readjusting the foreign policy team, and reshuffling local governance elites. The political transition—still ongoing—has a lot of moving parts and is unfolding in fits and starts. Its key actors are not necessarily visible and their intentions are not always clear. It is still uncertain who will be left standing when the dust finally settles. Some personnel changes appear to be quite natural, especially where health and age offer helpful excuses. Others are unusual and even unprecedented, given the speed and manner with which they were reportedly implemented. Many personnel developments are the products of jockeying for power by various players. Personal loyalties command a special premium. Job performance and substantive knowledge rarely matter. Corruption is a double-edged sword: only those who have mastered it succeed. In their totality, these frequent reshuffles create the appearance of increasing uncertainty, tension, uneasiness, lack of firm direction, cracks, and disunity. But in my judgment, they do not rise yet to the level of potentially threatening regime stability because they have little impact on its perceived legitimacy or performance. They are not fueled by factionalism nor do they meet internal elite resistance. They do not spill over into the broader society and do not agitate the general public, which is generally not aware of what is going on at the top anyway. But, they have created a new category of political losers among former senior party and military officials and have generated some obvious hurt feelings and bad memories, which could serve as a potent source of potential opposition in the future. After Kim Jong Il’s death, many analysts expressed great confidence that in the next few years North Korea would be led by the same people who had run it over the previous decade. They believed Kim Jong Un’s young age and inexperience would make it easier for the time-tested party apparatchiks and Songun (military-first)-accustomed generals to manipulate the young ruler, to influence his decisions, and to control his policies from behind the scenes. These predictions proved to be close to the mark on the family side, only partially correct on the party side, largely wrong on the government side, and absolutely wrong on the military side. Last April, North Korea unveiled a new governing system presided over by Kim Jong Un, the third generation Mangyongdae dynasty ruler who declared the commencement of the second century of the Juche revolution and Kim family rule. Depending on our assumptions about the degree of his control over the party, state, and military, one can come up with competing explanations of what may have been driving the long-overdue overhaul of the governing system. Supporting this hypothesis, out of the original seven senior officials who walked alongside the hearse carrying the body of Kim Jong Il during the final funeral procession on December 28, 2011—the so-called Gang of Seven, portrayed by the conservative ROK media as the most trusted aides of Kim Jong Un,—four have already lost power (SSD Director U Tong Chuk, former Chief of General Staff Ri Yong Ho, and Defense Ministers 75-year old Kim Yong Chun and Kim Chong Gak were dismissed);, while two others—Party Secretaries 86-year old Kim Ki Nam and 83-year old Choe Tae Bok—failed to make it into the inner circle. Only one man from the original Gang of Seven—Kim Jong Un’s uncle Jang Song Thaek (66)—was able to gain more power and increase his party rankings in the past year. A second hypothesis assumes that Kim Jong Un is only partially in control, and someone else may be calling the shots or manipulating him. In that case, the inauguration of a new national security team may indicate that those officials who gained power in the recent reshuffles, including Jang Song Thaek and his longtime protégé Choe Ryong Hae, finally succeeded in dismantling the protections built into the successor support system by Kim Jong Il to prevent these potential rivals from staging a palace coup against his son. By gradually dismantling the guardianship system built by Kim Jong Il in the last two years of his life, Jang appears to have cleared the obstacles facing his own possible power takeover bid. At the same time, I cannot exclude the possibility that the officials purged (U Tong Chuk, Ri Yong Ho, Kim Chong Gak, Chon Pyong Ho, and others) may have been accused of saying or doing something threatening to Kim Jong Un’s rule (disloyalty, arrogance and high-handedness, policy mistakes, coup plot, etc.). Kim’s aunt and uncle may have convinced the young and easily impressionable ruler to remove them from power, which in turn, strengthened their own influence inside the palace. One of Kim’s new guardians reportedly once told Kim’s uncle Jang, “If anyone were to stand in the way of Kim Jong Un, they would never be forgiven no matter who they were.” Little did he know, and now he is gone; whereas Jang’s power has grown unchecked. A third hypothesis assumes that Kim Jong Un is a legacy figurehead leader symbolizing regime continuity and elevated only temporarily for the sake of preserving internal political stability to preside over several elite groups competing for power and policy influence. If that is the case, then the recent personnel overhaul may reflect a power rebalancing between competing groups of officials, especially the party and the military, the military and security, the civilian economic bloc and defense industry, and the men in uniform. Based on my evaluation of Kim’s first year in power, I judge that he reigns supreme. He proved to be a formidable opponent to be discounted only at one’s own peril. He has different ropes for different folks. He demonstrated swift ruthlessness in eliminating his potential enemies inside the royal palace and military barracks. As for his uncle Jang, I believe the young marshal will use him for as long as he has to, but then he will surely cut him off, probably without much regret, just like his father purged his own uncle Kim Yong Ju when Kim Jong Il deemed him as a threat to his own power bid in the mid-1970s. The latest successful satellite launch will further boost Kim Jong Un’s domestic legitimacy, increase his political capital, undermine potential critics, help him silence military discontent, and increase his international stature and bargaining power. Kim Jong Un’s overhaul of the legacy government will not be complete until he replaces the nominal heads of the state and government and puts his own confidants into these two posts. Hence, senior state and government leaders—President of SPA Presidium Kim Yong Nam (84), and two SPA Vice-Chairmen Choe Tae Pok (82) and Yang Hyong Sop (87), as well as Premier Choe Yong Rim (82)—may be next in line for replacement, possibly in the coming year. Who replaces Kim Yong Nam may tell us about the future direction of the restructuring of the political system. If Kim Jong Un decides to assume the position himself, it will be an unexpected move, possibly indicating his ambition eventually to allow a popular election of the head of state to further boost his legitimacy so that he can become the first popularly elected president of the North sometime in the distant future (on par with the South Korean President). This course of action will be a good indicator that Kim is in full control because it will further concentrate power in his hands. The appointment of Jang Song Thaek as the nominal head of state will be an indicator of Jang’s rising political and foreign policy influence and continued efforts to secure his grip on power beyond his wife Kim Kyong Hui. It will give more weight to the second hypothesis about Kim’s sharing of power with regime heavyweights like Jang. However, if Kim Yong Nam’s replacement is someone like Kang Sok Ju (73)—who is a Politburo Member and Kim Jong Il’s longtime confidant on foreign affairs, like Kim Yong Nam used to be prior to his elevation to the position of the nominal head of state—it will be a sign of regime continuity and a bit of evidence supporting the argument that Kim Jong Un, despite his growing political capital, is still beholden to the old elites and is not able or willing yet to fundamentally restructure the political system he inherited from his father. Finally, the appointment of some dark horse would signal that the power of the President of the SPA Presidium may be downgraded or shifted to some other institution, perhaps to be created in the course of a possible future constitutional reform, especially if Kim Jong Un decides to rule like his grandfather did, relying on intra-party faction competition and re-establishing the institution of the presidency and its subordinate structures similar to the old central people’s committee. Who replaces Premier Choe Yong Rim may tell us about the future direction of North Korea’s socio-economic policy. The return of former premier and current director of the WPK’s Central Committee light industry department Pak Pong Ju would be in line with Jang Song Thaek’s rising influence because of Pak’s longtime work under Jang’s wife, and would confirm Pyongyang’s intent to solidify the government’s focus on the people’s well-being and consumer economy. The appointment of Kwak Pom Gi, party secretary for economic affairs, albeit unlikely, or the recently rehabilitated vice-premier Chon Sung Hun will reveal Kim’s prioritization of economic self-reliance and industrial prowess. The appointment of the current chairman of the State Planning Commission Ro Tu Chol may reflect renewed effort at centralized planning. If vice-premier Han Kwang Bok becomes the DPRK’s first female premier, one can expect greater attention to social issues, science and technology, and a knowledge-based economy. Alternatively, if Kim Jong Un chooses to appoint an unknown younger figure, this may signal the possible beginning of a real push for economic reforms. Andrei Lankov, “It’s not All Change in Pyongyang,” Asia Times Online, January 5, 2012, http://www.atimes.com/atimes/Korea/NA05Dg01.html. “Kim Jong-un Named 1st Secretary of the Workers Party,” Chosun Ilbo, April 12, 2012, http://english.chosun.com/site/data/html_dir/2012/04/12/2012041200959.html. “N. Korea names new defence minister before launch,” Agence France Press, April 111, 2012, http://www.mysinchew.com/node/72392. “The ‘Gang of 7’ Behind Kim Jong-un,” Chosun Ilbo, December 29, 2011, http://english.chosun.com/site/data/html_dir/2011/12/29/2011122901522.html. Andrew Salmon, “Power behind Kim Jong-un’s throne: the ‘Gang of Seven’ emerges from the shadows,” The Telegraph, December 31, 2011, http://www.telegraph.co.uk/news/worldnews/asia/northkorea/8986568/Power-behind-Kim-Jong-uns-throne-the-Gang-of-Seven-emerges-from-the-shadows.html. “N. Korea purged senior intelligence official,” Korea Times, April 17, 2012, http://www.koreatimes.co.kr/www/news/nation/2012/04/113_109120.html. “N. Korea names new defence minister before launch,” Agence France Press, April 11, 2012, http://www.mysinchew.com/node/72392. 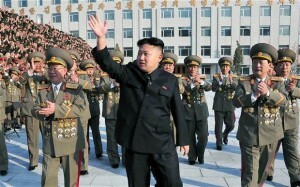 “Kim Jong-un’s Aunt Seen as Power Behind the Throne,” Chosun Ilbo, April 12, 2012, http://english.chosun.com/site/data/html_dir/2012/04/12/2012041201068.html. These officials were part of the original successor support group that was sidelined by Kim Jong Il after the Third Workers’ Party Korea (WPK) Conference in September 2010. Lee Young Hwa, “Cracks in Kim Jong Eun System,” Daily NK, February 9, 2012, http://www.dailynk.com/english/read.php?cataId=nk03600&num=8787. Kim Kyu-won, “Kim Jong-un speaks his father’s words with his grandpa’s face,” Hangyeoreh, April 16, 2012, http://english.hani.co.kr/arti/english_edition/e_northkorea/528499.html. “Kim Jong-un is out of mourning, out in public,” JoongAng Ilbo, February 6, 012, http://koreajoongangdaily.joinsmsn.com/news/article/article.aspx?aid=2947978&cloc=joongangdaily|home|newslist1.